In general, I have never really gave much thought to webcams. Though we all use them at one time or another, they never struck me as an area of technology that would be terribly interesting. Out of a complete whim, I bought the new Logitech Brio 4K web cam after seeing a YouTube review on the device. I was curious how good it could be, and most of all, how useful it would be in what I do. I was intrigued by potential of having a 4K camera on my desk, but my real attraction was to experiment more with Windows Hello. I have used the fingerprint readers on my laptops for Windows Hello and was impressed by how well that worked so I wanted to see how consistent and useful a Windows Hello camera would be. The setup was pretty easy for the most part. Unlike many other devices, this is a two-part setup process if you want to take full advantage of the device. The first part is plug and play and works perfectly for Setting up Windows Hello and Skype. It detects the devices and loads default drivers to get you up and going. The second part requires a bit more work. You will need to go to their support site and download the latest firmware. This is important as the new firmware contains fixes and new features you will want. In addition, you will want to get the settings app which will allow you to take better control of your camera settings as well as exploiting some of the power in the manual controls. Things like white balance, focus, and default zoom configurations are among a few of these. For me the key features are 4K@30fps, direct support for XSplit software, and of course Windows Hello. As my video recording/publishing needs are simple, 4K support may seem unnecessary. 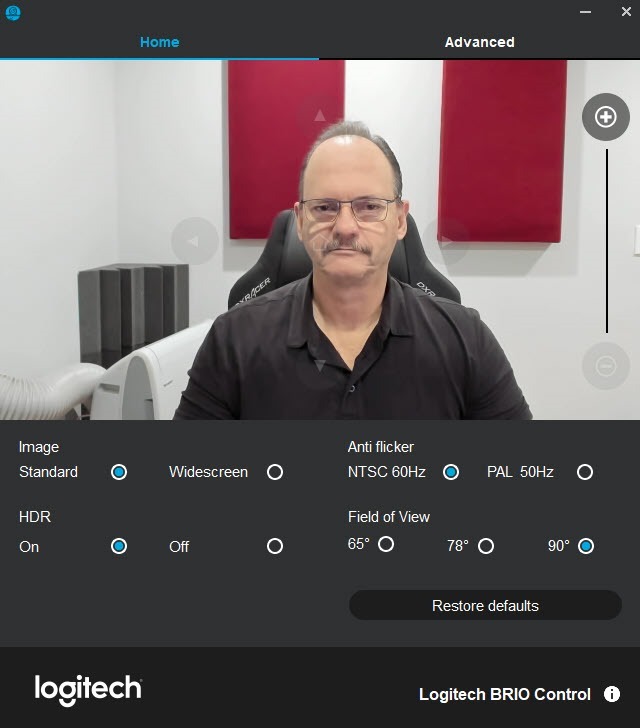 If you consider the fact that you can crop the video during editing and not lose any resolution when publishing in 1080P, it makes much more useful. It is always better to have more than less resolution as up-scaling can cause issues. 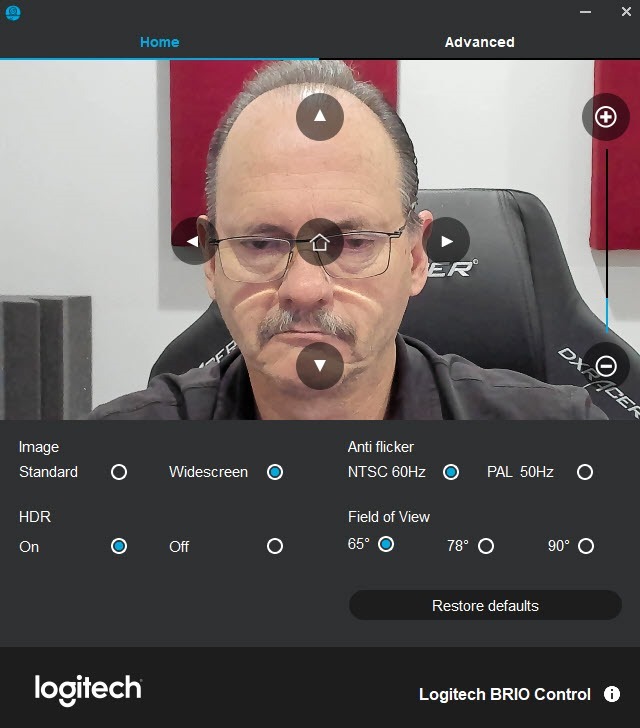 I truly liked the idea that the XSplit software I use read the camera and its capabilities making the addition to my workflow painless. The biggest surprise I experienced was the speed and accuracy when using Windows Hello. It is so fast that I am logged on to the desktop before I have finished positioning myself in my chair. I am sure that some of the speed comes from the computer, but this camera is faster than anything I have seen for Windows Hello. The only issue I found was the software did not play well with my older web cam. I had read where people have moved their older cameras to another USB controller which allowed things to work, but for me I opted to remove my older web cam and just leave the Brio. 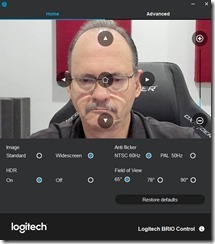 I hope that Logitech addresses this in a future driver update to allow us to easily run multiple cameras. In the meantime, I am OK with using just the one Brio as it worked well for me. 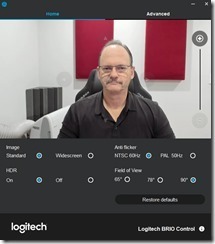 As you can see from the video example below, the camera performs great as both a high-end web cam and a budget project cam. The auto focus is extremely quick and does not exhibit the trait of struggling to focus that you sometimes see on other cameras. I guess the big surprise for me was how well Windows Hello works. It is very accurate, repeatable, and extremely fast. 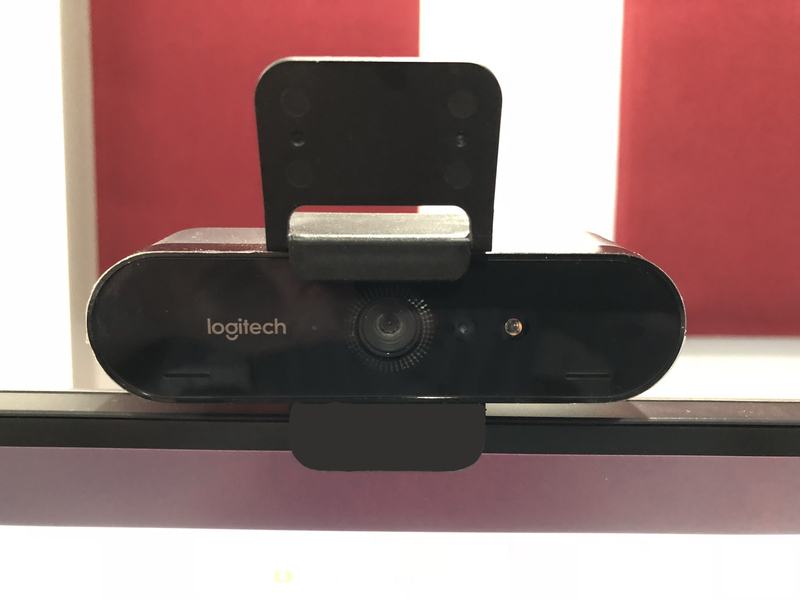 I know it may seem a bit expensive for a web cam but when you consider the extra resolution, the speed, support for Windows Hello, and the versatility, it actually begins to make sense. I have been using now for about 4 months and it still impresses me how well it works. If you would have asked me 6 months ago if a web cam was worth this much money I would have told you no, but if you ask me now, I think it is actually a pretty good value given the extra features.